Following the success of the renowned Aquastar 74 (which has been in production for 10 years) the company have now released details of the new Aquastar 75. The new design continues the understanding of tradition with modernity carefully balanced to incorporate the Companies philosophy of evolution. 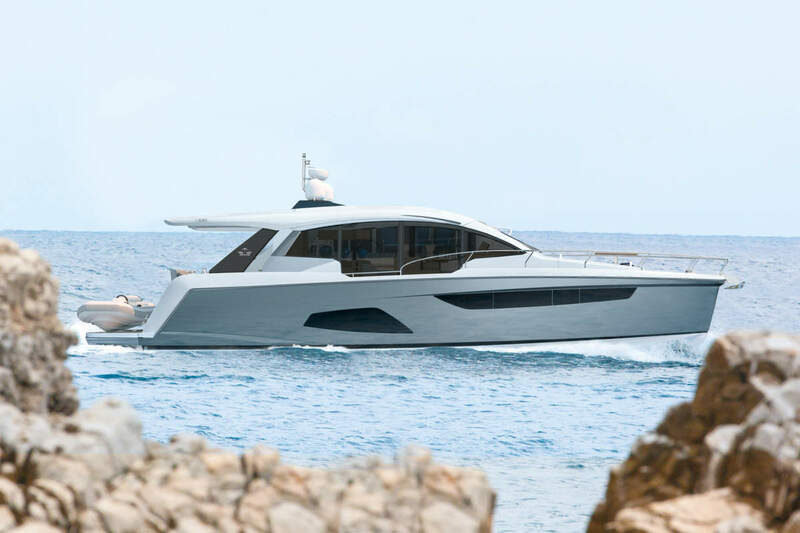 The new Aquastar 75, styled by ‘Design Unlimited’ shows uncompromising elegance, strength and integrity. Aquastar state of the art, inspired, stabilized motor yachts are respected the world over. Style and function go hand in hand with key design elements in your very own motor yacht. This stunning looking craft has a contemporary look which will stand the test of time when other designs may be showing their age. Aquastar boats are legendary for all round sea-keeping ability and this new luxury vessel retains all of those qualities which have been proven over many years on commercial boats. A further benefit is a very comfortable hull in a head sea that will not suffer the pounding of a planing hull driven at speed. Owners can sleep in comfort on passage and enjoy arriving at their destination fully refreshed. 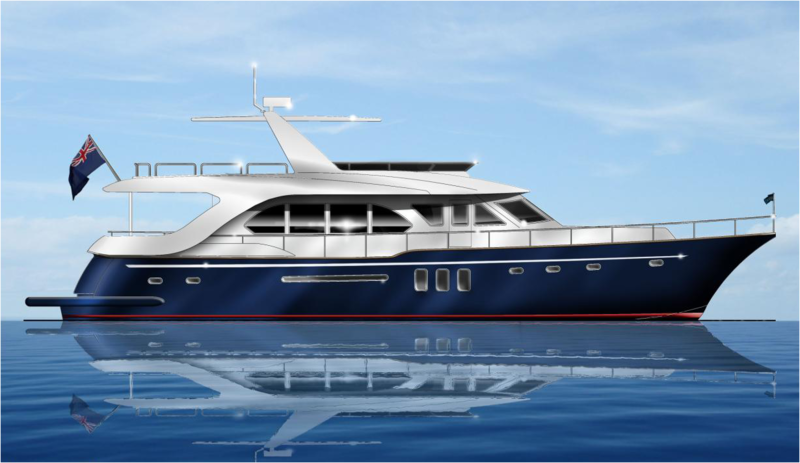 With the latest technology built in at every stage, it goes without saying she will be fitted with full stabilization that also works at anchor (a must for a modern motor yacht). The boat will be easily handled by 2 people, being fitted with remotely controlled hydraulic bow and stern thrusters. The bathing deck platform is hydraulically operated which gives easy access to the water and makes the launching of a tender simplicity itself. Fuel consumption is kept to a minimum as a result of the good balance between beam and hull length and a very slippery hull shape. The Caterpillar C18 1150 HP twin shaft drive is the standard fit. This solid straight 6 gives good power in reserve. Alternatively the well tested C15 860 HP is available as an option. Both engines provide good performance, range and economy. The Aquastar 75′ motor yacht also has a very high standard of fail safe electrical systems, unparalleled attention built into each craft. Two separate NMEA bus lines gives system redundancy, so single point failures are a thing of the past. With two processors both primary and secondary systems monitor each other at all times. Built in diagnostics designed to monitor itself, giving accurate information for trouble shooting and status. There is an option to remotely access your boat cameras and systems including giving your shore power supply status, control of lights and much more from your smart phone. The finest fail safe electrical system available with aerospace reliability. The interior has an imaginative layout and offers superb accommodation with an efficient helm station. Our Guernsey boatyard builds bespoke interiors to owners’ precise requirements and owners can work with our top stylists to specify the layout and style interiors to a co-ordinated look. Owner’s comments on the build process include “a most enjoyable experience”. Aquastar custom build to client’s wishes and personal attention to detail is a byword at the boatyard. On top of that they offer sound investment at very competitive costs. Great cruiser from Aquastar, came across one the other day and its a good as your pictures suggest.